"Captive Wild Woman" (1943) from Universal has definite roots in one of that company's staples, the classic "Frankenstein" (1931). At heart it's a tale about an obsessed scientist performing experiments on humans and creating a monster. 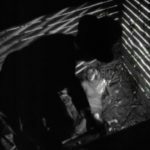 There's also more than a little bit of "Murders in the Rue Morgue" (1932) here as our monster happens to be an ape, and this mad doctor is also seeking to humanize the animal through his experiments. 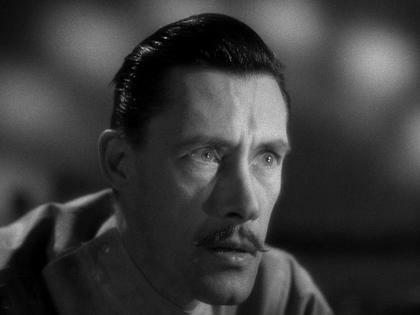 Directed by Edward Dmytryk (soon better known for noir classics "Murder My Sweet" and "Crossfire"), "Captive Wild Woman" stars John Carradine as Dr. Sigmund Walters. 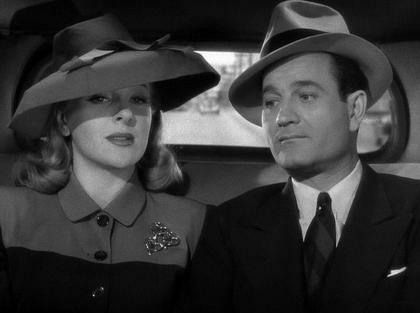 Walters is charming enough to have taken Beth Colman (Evelyn Ankers) out to dinner a few times while her beau, Fred Mason (Milburne Stone), was away on safari gathering circus animals, but the successful gland expert actually seeks to create a race of supermen. "Isn't that a laudable intent?" Carradine's mad doctor asks. "Captive Wild Woman" would be the first of numerous horror leads to come for Carradine, who carved out a notable career in the genre. "Captive Wild Woman" isn't all gloom and doom however, as the circus setting allows for a great deal of action to be weaved into what was assuredly an entertaining hour for school children during a few weekends of 1943. 2009 animal lovers are likely to be appalled by much of the circus training (whips, chairs, and a pistol), though "Captive Wild Woman" does go out of its way to scold one of the workers when he mishandles the animals. 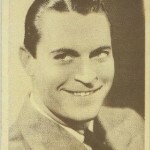 Much of the action footage is actually reused from an even earlier production, 1933's "The Big Cage" featuring famed circus showman Clyde Beatty. While you can most definitely see Beatty in a few quick cuts as Fred Mason is captured in profile, it's not too jarring and not having seen the earlier film myself was a better effect than just leaving the action to my imagination. Milburne Stone was cast as Fred largely because of his physical resemblance to Beatty. Dr. Walters is treating Beth's sister, Dorothy (Martha MacVicker, better known later as Martha Vickers) for a gland problem and as it turns out doing his best to get close to Beth as a pretense for meeting Fred. Immediately after the two men meet and shake hands, Fred whisks the Doc away to show off his circus animals. Bad move. While Fred has brought back almost exclusively lions and tigers, a very special lady by the name of Cheela is caged up as well. Cheela the gorilla (Ray Corrigan suited up) shakes hands with Fred, turns for him to scratch her back, and is generally charming enough to gain the Doctor's attention. 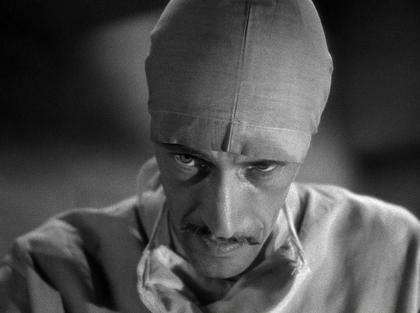 After the Doctor has Cheela kidnapped and delivered to his sanitarium, Carradine gets to go a little crazy. Young Dorothy is slabbed on one side, unconscious Cheela on the other as a transfusion takes place. The Doc's nurse (Fay Helm) is repelled by the experiment, objects, and so Doctor Walters decides it'd probably be better to use her cerebrum in the experiment than Dorothy's, who after all, is Beth's sister. Of course, the experiment is a success ... at least initially. Cheela becomes Paula Dupree, played mute by the exotic Acquanetta, who born Mildred Davenport wasn't quite as exotic as theatergoers were led to believe. It's soon discovered that Paula has a calming effect on the animals, a great help to Fred, who's having a pretty terrible time of it on his own. All Paula has to do is stand outside the cage and open her eyes wide--her stare drives the animals back. Paula's expressions make clear that she enjoys her time with Fred, and why not, she was quite attached to him as Cheela, but after witnessing his embrace with Beth, poor Paula snaps. 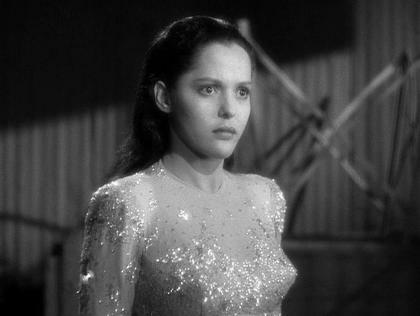 Acquanetta is discussed in more detail in a more recent article I wrote about DEAD MAN'S EYES (1944). Towards the bottom of THIS POST is an entire section about the actress and her background. The performances in "Captive Wild Woman" are much better than you'd expect for a film of its title, but then again these are all known actors, with the exception of Acquanetta, who have long Hollywood careers. While I'm a tough sell on a monkey suit, it's really done better than usual here, largely because in Corrigan they have the best "ape" performer available. The animal scenes are definitely exciting, though again, not having seen "The Big Cage" they were all original to me, still, every viewer will notice when old action is cut in. I kept expecting Acquanetta to speak, it looked like she wanted too, and found it odd that none of the characters asked why she was silent. Despite her weaknesses on camera she was also involved in the best scenes of "Captive Wild Woman" during the transformation shots showing her in states between Cheela the Ape and Paula Dupree. Makeup done by legendary Jack Pierce, who's the artist behind the entire catalog of classic Universal monsters. "Captive Wild Woman" is actually the first of a Paula Dupree trilogy, followed by 1944's "Jungle Woman" which saw Acquanetta reprising Paula as well as the returns of Stone and Ankers and the addition of J. Carrol Naish, and then "The Jungle Captive" (1945) which featured an all new cast including Vicky Lane as Paula Dupree. "Captive Wild Woman" is one of five Universal horror movies found in the new Universal Horror: Classic Movie Archive 2-DVD set. 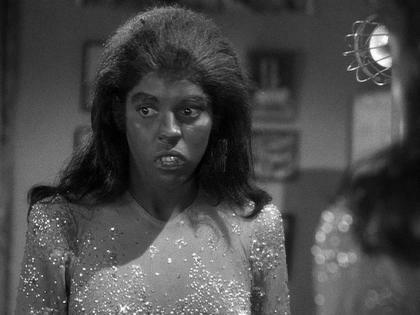 Also included are "The Black Cat" (1941), "Man Made Monster" (1941), "Horror Island" (1941), and "Night Monster" (1942). What a classic, I want to see the full transformation now! You can see this movie on Valentine’s Day 2/14/2015 on MeTV, 10 pm EST. Our host Svengoolie will provide background and probably some jokes as well. The transformation is also represented (four photos) in UNIVERSAL HORRORS, the go-to book for all these Universal movies.